Worship at the Crafton Heights church on 26 August included a chance to listen (again) to an old story: Paul’s recollection of his conversion as recorded in Acts 21:40 – 22:41. The other reading for the day came from I Peter 2:9. Many of you know that I’m getting ready to head to the Chicago area, where on Saturday, my daughter Ariel will pledge her love and troth to a young man named Drew. I am excited about this change for Ariel and Drew, and eager to be in that setting with them. And it’s not just them, of course – family and friends from around the country will gather for a few days of preparation and celebration. 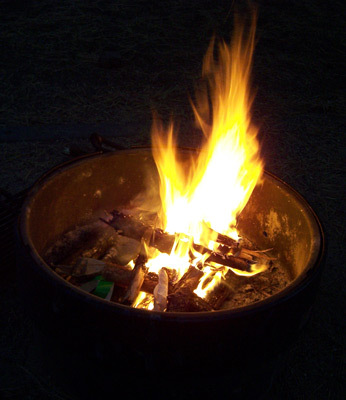 One of the things I’m looking forward to is spending some time with people around the campfire, telling stories. Friends, let me ask you this: do you know someone who loves to tell stories? Do you know someone who loves to tell stories so much, in fact, that they’re not above telling the same story more than once? Do you know someone who gets started on a story that you’ve heard a dozen times before and it doesn’t seem to matter – they just keep on telling the story, confident that it’s a funny or sad or powerful as it was the first eleven times they told it to you? No, I’m not talking about myself here… But my hunch is that you do know someone who is not afraid to tell, and re-tell, a good story. Those are the kinds of campfire stories I’m talking about here. Paul the Apostle was a bit of a story-teller himself. 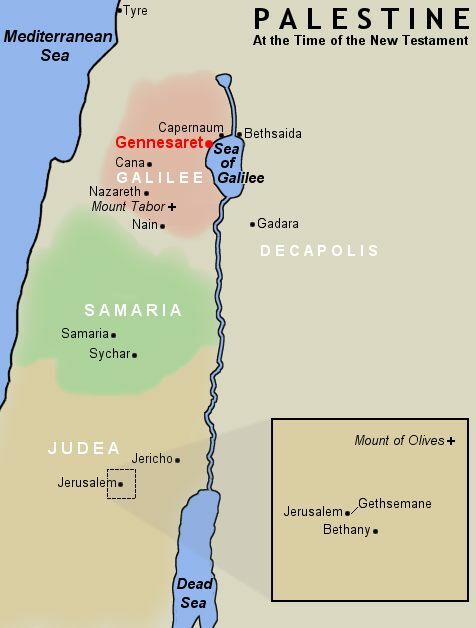 In Acts 21, he had just arrived in Jerusalem, where he was to make his report to the home office about the results of his gospel ministry among the Gentiles. 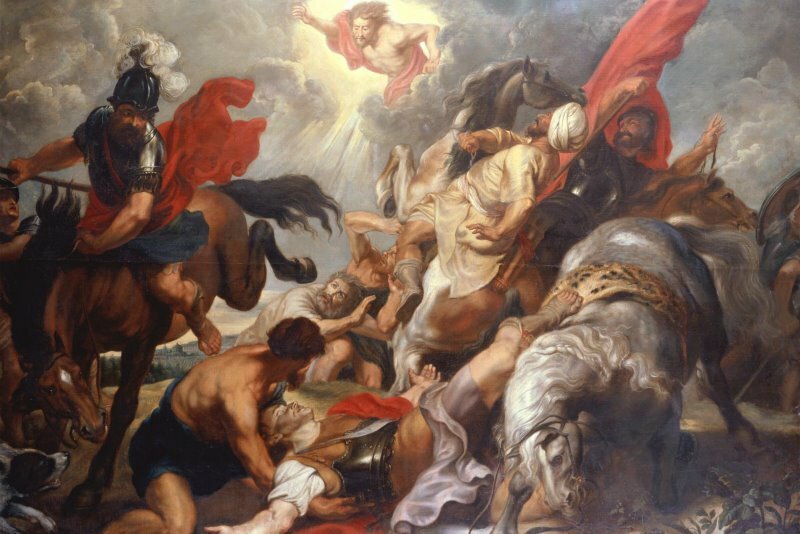 The other followers of Jesus are satisfied with the news, but as is often the case, not everyone is satisfied and somehow, before you know it, a mob had formed, accusing Paul of having left the true faith. Mobs being what they are, it’s not too long before the National Guard gets called in and Paul is in chains. He asks for, and is given permission to, address the crowd. And what does he say? 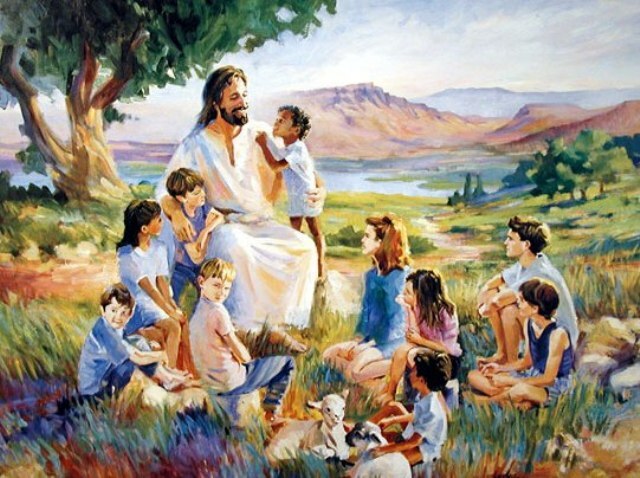 He tells them about the day he met Jesus. For people who knew Paul, this must have been the part of the day where they said, “What, this again? Is this where we hear about the light, the blindness, and the voice? Look, Paul, we get it. 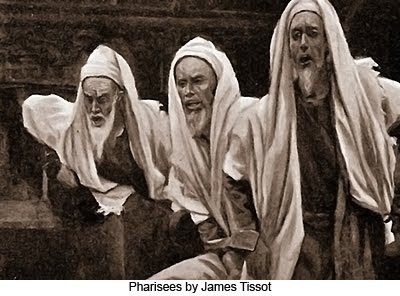 You were there…” The truth is that Paul simply could not shut up about the day that he met the Lord. It’s recorded for us three times in the book of Acts, and referred to in the letters to the Corinthians, Galatians, Philippians, and Timothy. Why does he do this? For me, when I tell a story more than once, it’s for one of several reasons. Maybe I think it’s a particularly funny or clever story, and so I want to tell it so that you think I’m funny or clever. Maybe I just want you to like me better. Or maybe I tell a story again and again because the story helps illustrate some truth about my life that will help you understand a little bit better what makes me the way that I am. My hunch is that Paul kept re-telling the story of the day that he fell on his keister because it was an essential part of who he was and how he was called to be God’s person in the world. Paul kept on saying, “Let me tell you about the day I was converted” because that conversion became for Paul a defining moment of his life. I’d like to tell you about my conversion (again) – but before we get to that story, I want to think for a few moments about the idea of conversion in our world. When you think about conversions, about people being “born again”, about evangelism in our culture, what is the motive, the reason, the purpose for that? Do you remember the greatest film of all time, Cool Hand Luke ? Or perhaps you’re not much on music or films, but you like to read. Two of the best-selling Christian books in recent years are 90 Minutes in Heaven and Heaven is For Real, each of which offers readers a glimpse into heaven and an encouragement to plan for the afterlife. As you think about those three examples of popular culture from the past forty years, do you see what they have in common? Why do you become a Christian? So when you die, you can go to heaven. What’s the motivation for conversion? Getting right with Jesus so that I won’t go to Hell. 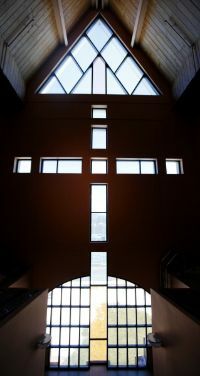 In fact, if you look at a good bit of popular Christianity in the world and in the church today, you’d get the impression that Jesus doesn’t really care too much about what happens from the time you accept him as Lord and Savior until you die – the main point is to get right now and hope that you die right so that you’re in the clear for eternity. Religion is essentially a “fire insurance” policy. It’s a “get out of jail free” card that lasts forever. Look again at the way that Paul tells his conversion story in Acts 22. He doesn’t mention heaven. Nothing about eternal life. I did a little digging in the books of Acts and found, not surprisingly, that it was full of conversions. Do you remember any of those stories? Who gets converted in Acts? None of these stories of dramatic conversions have as their main point the idea of getting to heaven right away. None of them talk about spending eternity in the everlasting arms. Heaven’s not a bad thing – it’s just not the main thing in these stories. 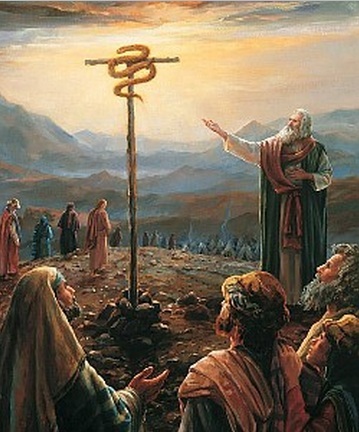 So why was Paul converted? According to Paul, here in Acts 22, it was so that he might know God, be a witness for God, and so that God could send Paul to the gentiles. God called Paul, not to remove him from the world, not to take him away from his pain and suffering – in fact, Paul had it a lot better before he became a Christian than he did after the fact. God didn’t call Paul in order to get Paul ready for heaven. God called Paul because God wanted to use Paul in order to take care of some of God’s business in the world. To put it simply, it wasn’t about Paul…it was about God. And then one year, my dad was out of work, and we couldn’t afford to send me on the youth retreat. I’d be forced to stay home and play football with the Hultberg boys instead of hanging around with the religious nut jobs. But at the last moment, we got a call from a somewhat reluctant advisor. Turns out that someone at the church had heard about our situation and offered to pay my way to camp. Yippee. But it was on that retreat that I heard the message of God’s love for me for the first time, and I felt as though the message of hope and forgiveness was big enough to include me. Since that time, I have understood my call as being to help others embrace the fullness of God in their own lives. Not surprisingly, much of this call has been oriented to young people – particularly to young people who think that God, Jesus, and Church are irrelevant and all pastors are boring and crotchety. And initially, I sensed that what God was asking me to do was to point people towards a personal relationship with God. I still do that, but have seen in the past thirty years a broadening of that call to help people seek God’s purposes for their lives in every area. And that call has led me to be broken by the plight of God’s people in Africa, the fight for justice that millions of people in the world experience every day, and a general concern for the marginalized in our society. Do I believe in heaven? I count on it. Do I hope to spend eternity with the Lord? You bet I do. But my salvation, my conversion is not primarily focused on sitting around and waiting until I die so that I can collect on my fire insurance policy. My relationship with God is not centered on what will happen when I die. It is centered on how I can be God’s agent in the world right now. That is the purpose for which God has called me. Take a look at the bulletin and look at the sermon title. “Orienteers Wanted”. W’e’re already to the middle of page seven and you’ve not heard me use that term at all. That doesn’t bode well for those of you hoping to get out of here at five minutes before 11, does it? Orienteers wanted. What is an orienteer? Orienteering is an activity wherein people use maps and compasses to move from one place in the woods to another place in the woods. Your map and your compass are used to orient you to your location in the world so that you can get from one place to the next in safety. Orienteers wander through the forest, looking for clues in the terrain and geography so that they can move from station to station along the course. If you were a true orienteer, working your way through the Allegheny National Forest, the absolute worst thing that could happen to you would be to have me show up in a helicopter saying, “It’s all right! I’m here to take you to the final station. Hop in!” Orienteers know that they’re staying in the woods, and they’re working on making sure that they know how to use their tools to survive and move along. The reality is, my friends, that I hope you have been found by Jesus. I hope you have been saved. But you’re still out there in the woods. Your life is not perfect. Like any good orienteer, you need a map and a compass. God is calling you to a new place. It’s good news! You will finally, ultimately, be in a place of perfection, rest, peace, and comfort. That’s what heaven is like, we think. But you are not going there now, so far as I know. You are still on your way. Take the map of God’s word and the compass that comes from being included in the body of Christ – the church. And be a person who is converted. And still converting. For the sake of the people around you who have not yet heard the call of Christ in their lives. So that’s my story, and I’m sticking to it. Amen. When we arrived on Sunday and found the center ablaze, we wondered whether the staff at Sunset Gap would be able to find meaningful work for us. After all, the main dorm had just burnt to the ground – the future of the ministry was up for grabs, and here’s a group of knuckleheads from Pittsburgh looking to help out. As mentioned earlier, we took our “fun day” on Monday in order to get out of their hair. So we packed into the vans and headed back to the mountains. We took our picnic lunch to the Great Smokey Mountains National Park, where we actually saw the sun shine for a few moments! Then we wandered back into Gatlinburg, where we visited The Ripley Aquarium of the Smokies. We don’t usually do the big expensive touristy things, but frankly, Tim and I were committed to keeping these kids warm and dry today. It worked. We had a great time, learned some, and laughed a lot. Our return to Sunset Gap meant a fantastic dinner of Pork Loin and Mac and Cheese, followed by an exploration of what it means to be an adult and maintaining your own faith journey. We planned the worship service for Sunday, August 19, where the young people will lead us in worship as we tell more stories of time here and the impact we hope it has. If you can join us, we’ll worship at 10 that day. The fire marshall showed up for an investigation at Sunset Gap today. Is this the real story behind the events at Sunset Gap on Sunday evening? Heavens, no. Tim is leading the crew in burning some debris, that’s all. Honest. A quick stop in the park for a picnic lunch turned into a wading opportunity for most of the kids. After yesterday, they thought the idea of going in the water in the SUNSHINE was an interesting experience. Hah. Kids. 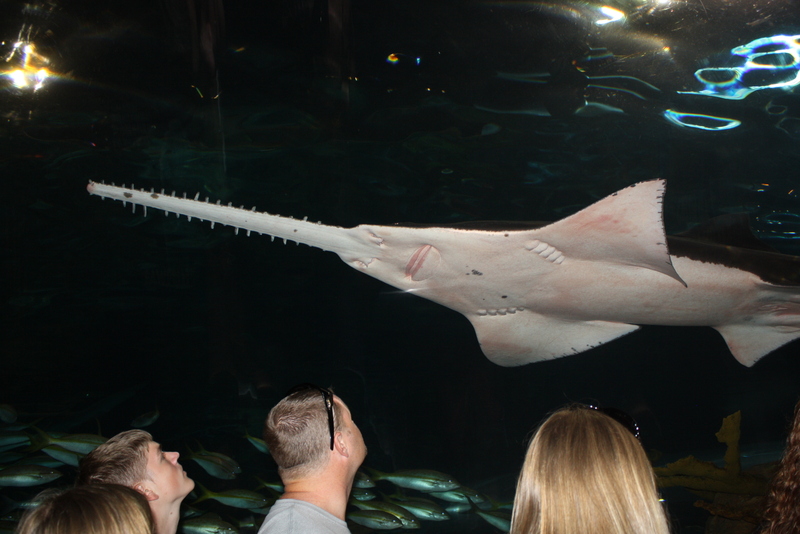 We were all very impressed by the size and prowess of the Sawtooth fish in the Shark Tank. 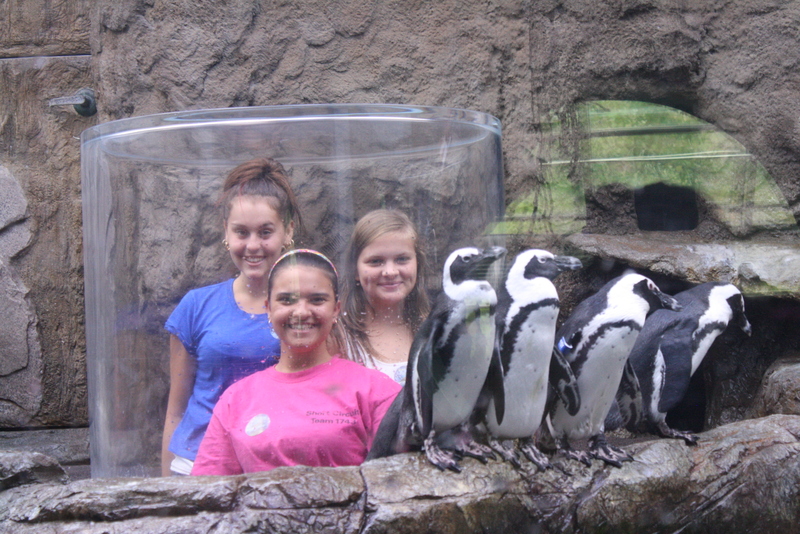 Well, look who is posing with the penguins at the Aquarium! 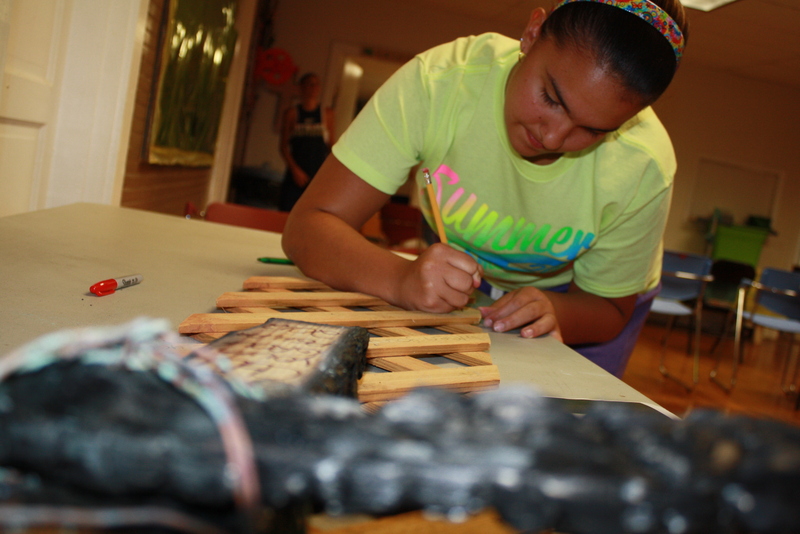 Each group at Sunset Gap leaves a moment to adorn the walls. Here, Lexi works on ours – some reclaimed wood and copper from the building destroyed in the fire is fashioned into a cross and surrounded by scripture. Good to know, I think. Good to know. Fifteen years ago, I went on a mission trip with a young man named Tim Salinetro – a trip to Washington DC for a youth evangelism conference. It was a great trip for many reasons. 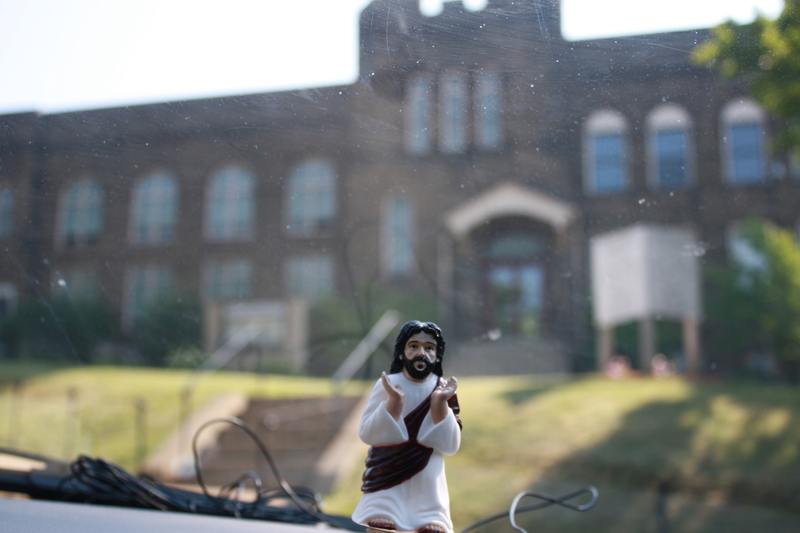 For most of the past fifteen years, Tim and I have spent at least a week together with young people on mission trips. I am grateful for that in so many ways. He is a dear brother and a great model for the kids. Me: Tim, what’s one of the key purposes of youth ministry? Tim: Making memories, Dave. Making memories. And he’s right. And we’ve made them. Chances are, you might have some yourself. I hope so. We made a few today. 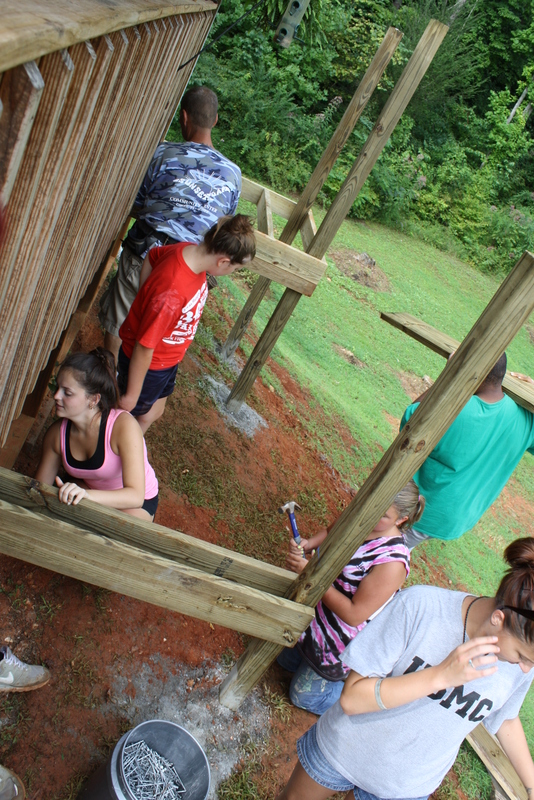 First, we finished the wheelchair ramp by lunchtime. As you will see, it looks good. More than that, it was great watching the kids break out of their usual relationship patterns and into some new working and partnership groups. And they really encouraged each other, which was a true blessing. They engaged Mr. Bice’s granddaughter, and they cheered for each other. You’d have liked it. Then, we found out that the folks at Sunset Gap didn’t have enough work for us to last through the afternoon. So Tim and I decided it was time to make a memory. This one, we decided, would involve finding a swimming hole in the Great Smokey Mountain National Park. So we hightailed it back to camp, changed into our swimwear, and headed for the hills. Some guys might have been deterred by threatening clouds. Others may have been troubled by thunder. Us? Not a chance. We finally found the trailhead and began to walk up. A few leaders might have been alarmed by the fact that one of the kids showed up for the hike without shoes. Yes, a 3 mile hike, barefoot. But again, that didn’t slow us up at all. As we climbed towards “Midnight Hole”, all we thought about was connecting with nature. When the thunder rumbled, Tim and I averted eye contact. If you had been there, you might have been concerned about the fact that the kids had no dry clothes to wear after swimming. That was a non-issue for us. They’re tough, right? So we made it to the spot, and we frolicked in the water for at least fifteen minutes before the rain started. A slow drizzle. A more steady pulsation. And then a torrential downpour. Being the quick studies that we are, we rounded up the kids, only to discover that one of the sets of flip flops had broken. So we had 2 barefoot kids coming down the hill. In the rain. With the thunder. And then the lightning. Again, some guys would have been a little nervous. Not us. Not until Tim remembered that the only key to the rental van – the key with the computer chip in it – had gone into Big Creek with him. But you know what? Sometimes God looks out for knuckleheads. We made it down the mountain fine. We unlocked the vans – both of them – and got the kids inside, and then turned up the heat full blast. And 12 idiots laughed all the way back to Sunset Gap, where we stood in line for cold showers, ate some amazingly good Chicken Alfredo, and then had the most honest discussion on fear and worry that we’ve had all year. These kids were there for each other today in big ways, and they learned something about God, too. Making memories. It’s what it’s about. Here are some images to share. Thanks for your prayers. 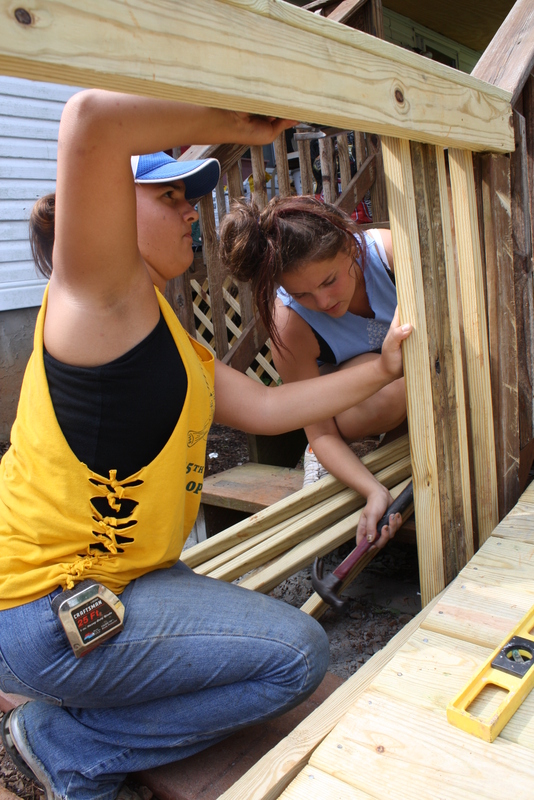 Lexi and Rachael putting the banisters up as the deck nears completion. David trimming up a decking board. 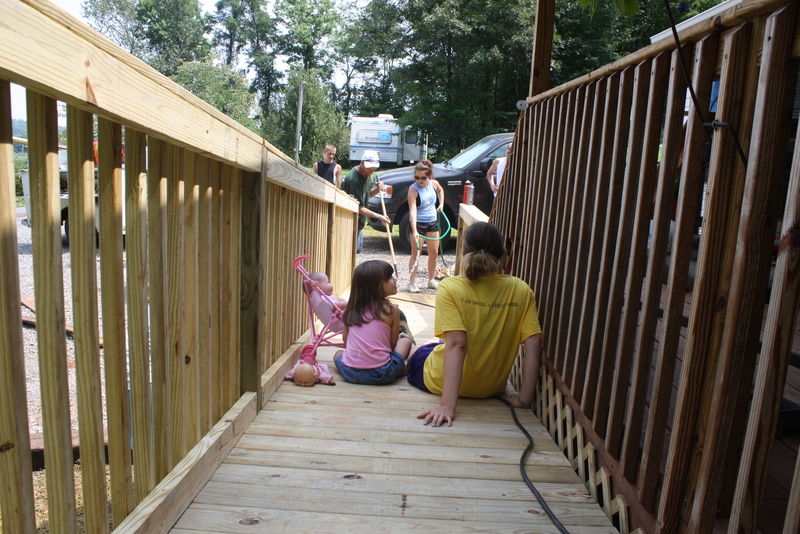 Mr. Bice’s granddaughter, Jaycee, inspects the workmanship on the ramp. 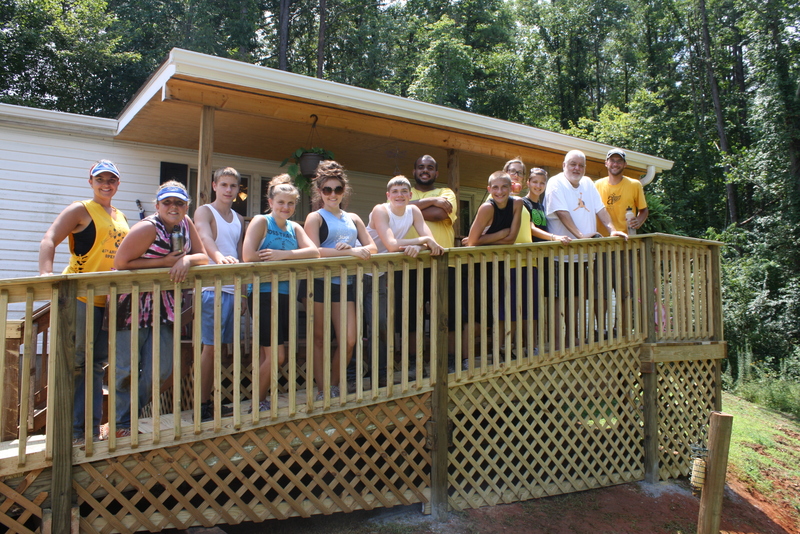 Mr. Bice and the group on the finished ramp. 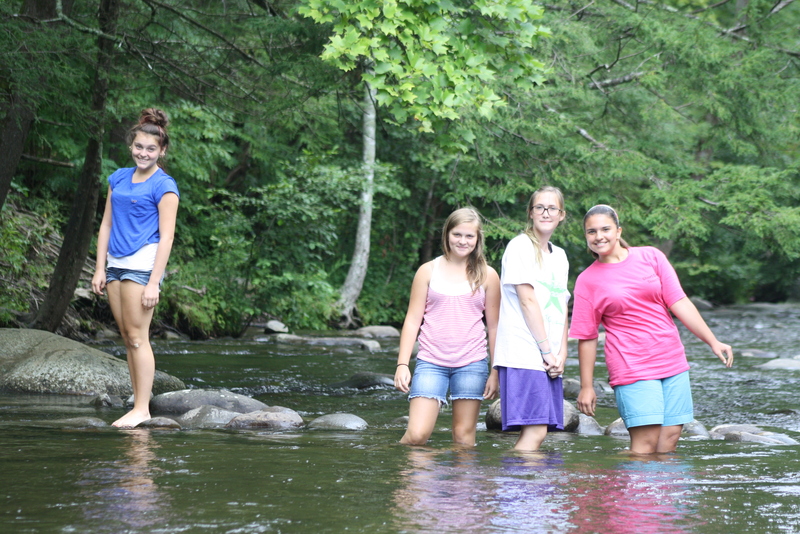 The group discovers the cool mountain water at the end of the trail in Big Creek. A rousing game of “King Frog”, AKA “Moose”. 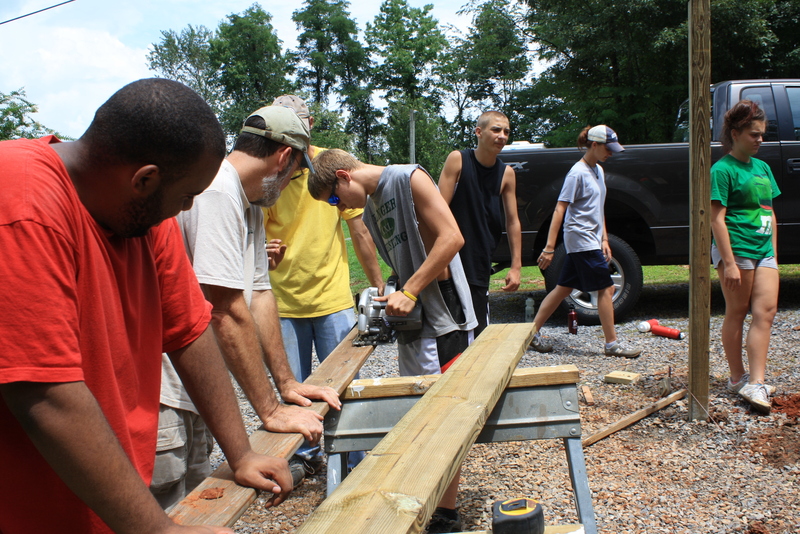 Wednesday was a wonderful day in Tennessee…it was the first day of the week without rain, and your CHUP Youth Mission team took full advantage of that by getting in a full day’s work at the site…and then some great activities back at Sunset Gap. After having set most of the footers for a wheelchair ramp yesterday, we spent most of the morning designing and affixing the joists to the footers. 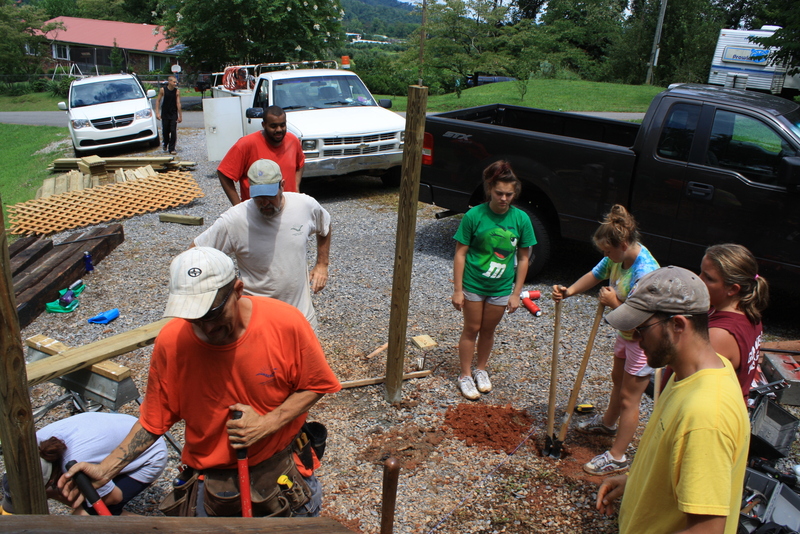 In addition, the team drilled through five 8.5 foot railroad ties and then drove some rebar into the ground to make them a safe and attractive addition to the Bice home. After lunch, the crew got a great system going that allowed them to lay as much decking as we had plankage – we ran out of wood (sort of like “Cool Hand Luke”, when the crew works so hard that they still have daylight left at the end of the job!). 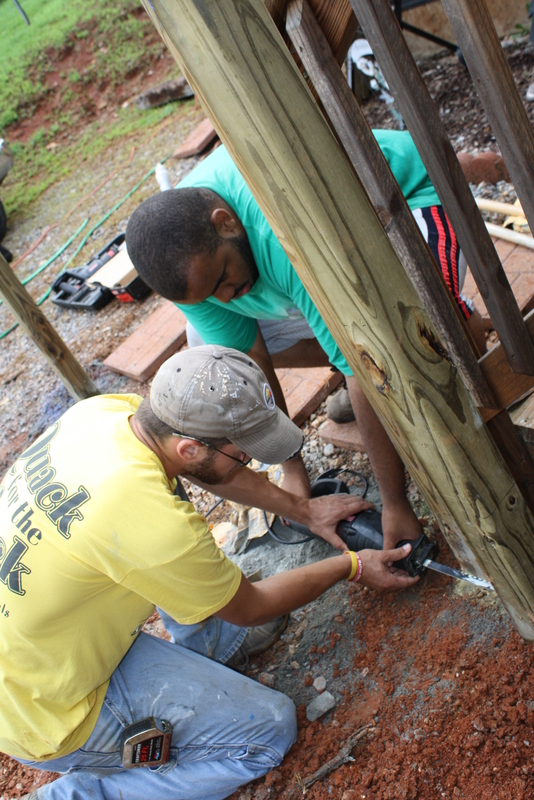 Tim and Jon use the reciprocating saw to trim up the footers on the ramp. The joists give the ramp some shape. Many hands make light work as the ramp begins to look like, well, a ramp! The homeowner’s parents invited us across the street for some cold watermelon and delightful shade at the end of a long workday. 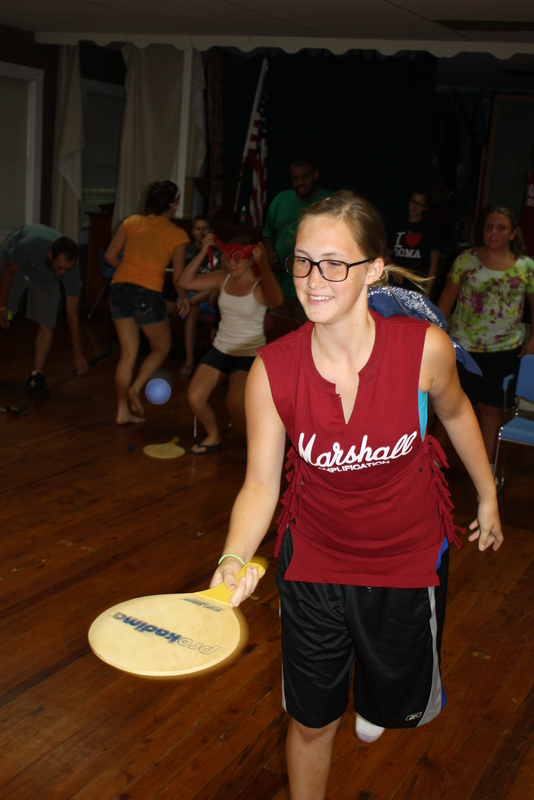 Another made-up game ended the night with laughter and energy release. 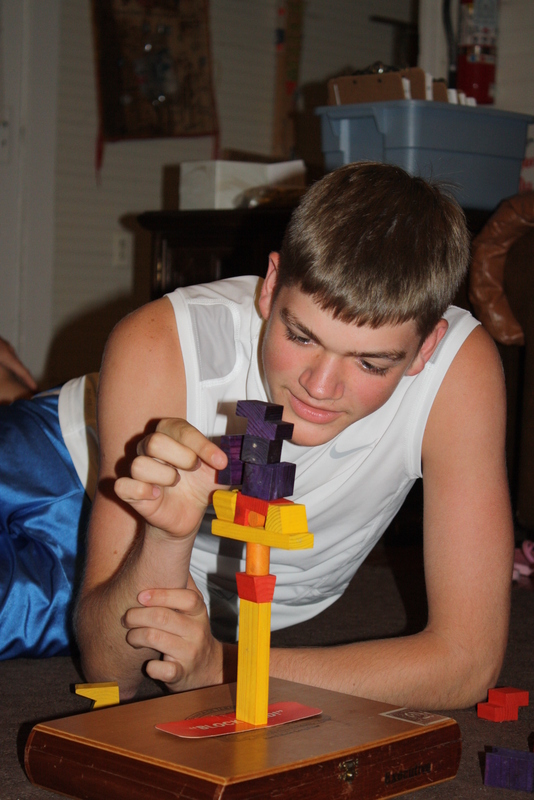 Tyler shows the skill and patience necessary to winning at “Blockhead”…for what that’s worth! We had a rough start to this trip – see the previous post. 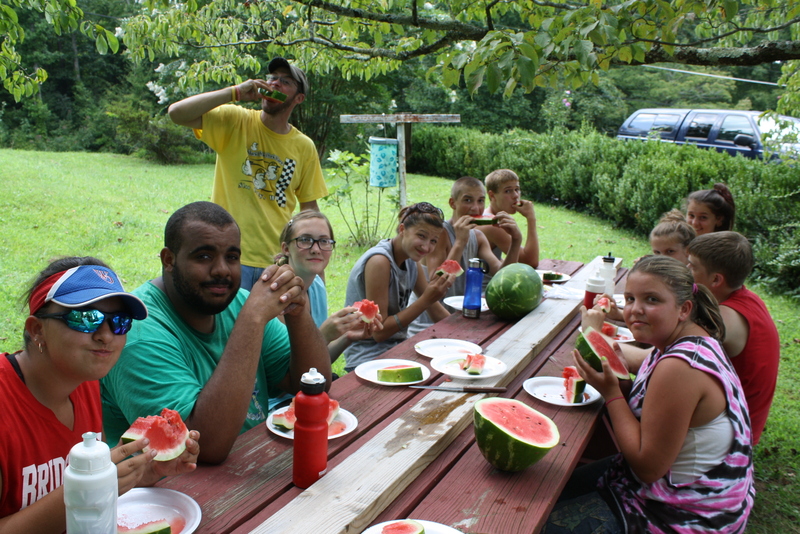 Today, however, we regained our Mission Trip Form and had a wonderful day of work, eating, playing, singing, and laughing in the community in which God has placed us. After a great breakfast, we headed about fifteen minutes away to the Bice home, where we were led by our intrepid guide, Randall, in laying out the basis for a wheelchair ramp. 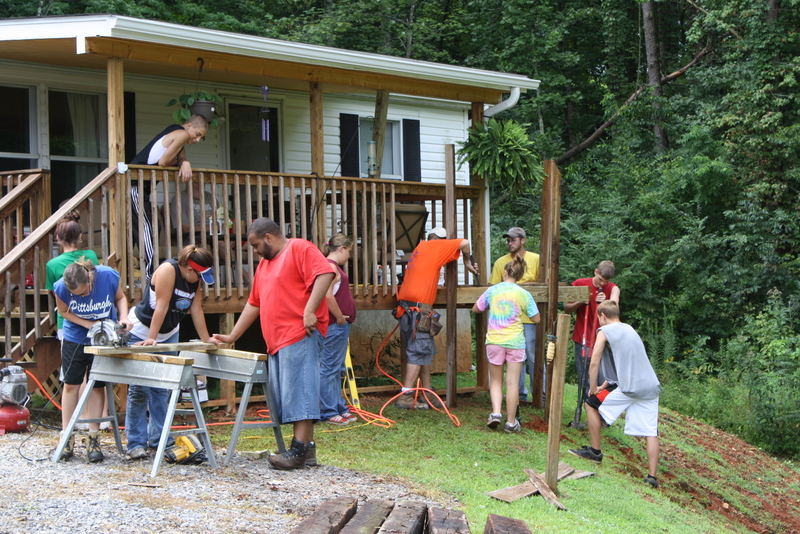 The group arriving at Mr. Bice’s home, where we’ve been asked to help erect a wheelchair ramp. 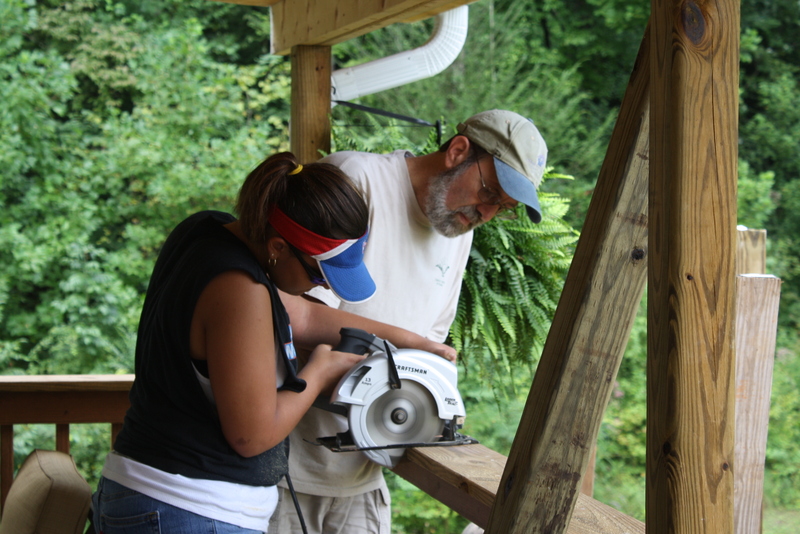 Lexi is showing us why some people call it a “skill saw”. It’s a fine cut! How many CHUPsters does it take to make sure it’s on the straight and level? 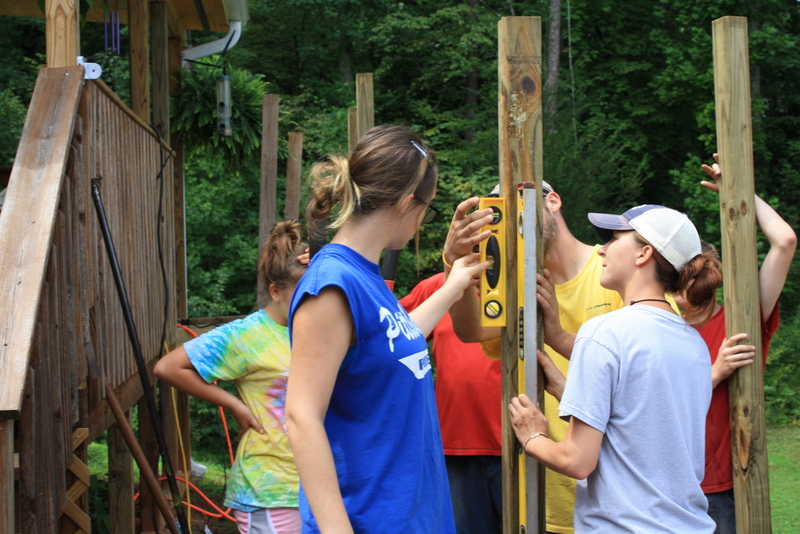 Setting up the poles for the wheelchair ramp. 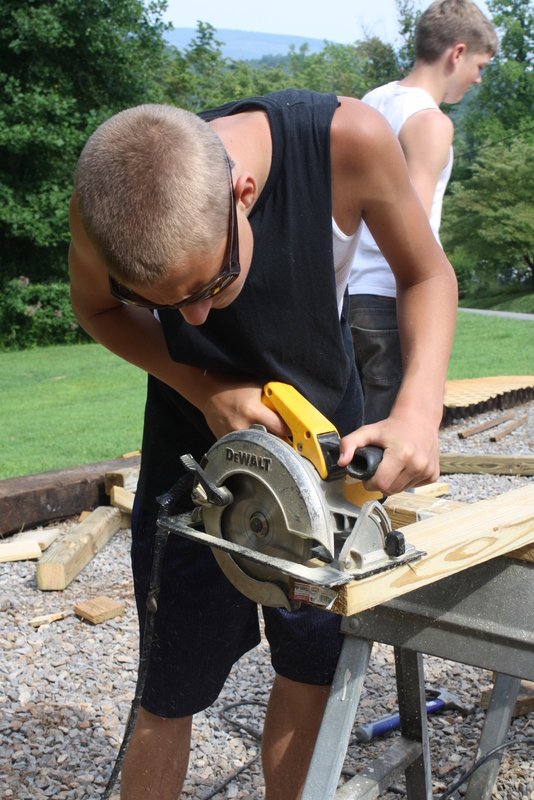 Joe showing us how to use the circular saw to “rip” a board. Digging the holes to support the wheelchair ramp. 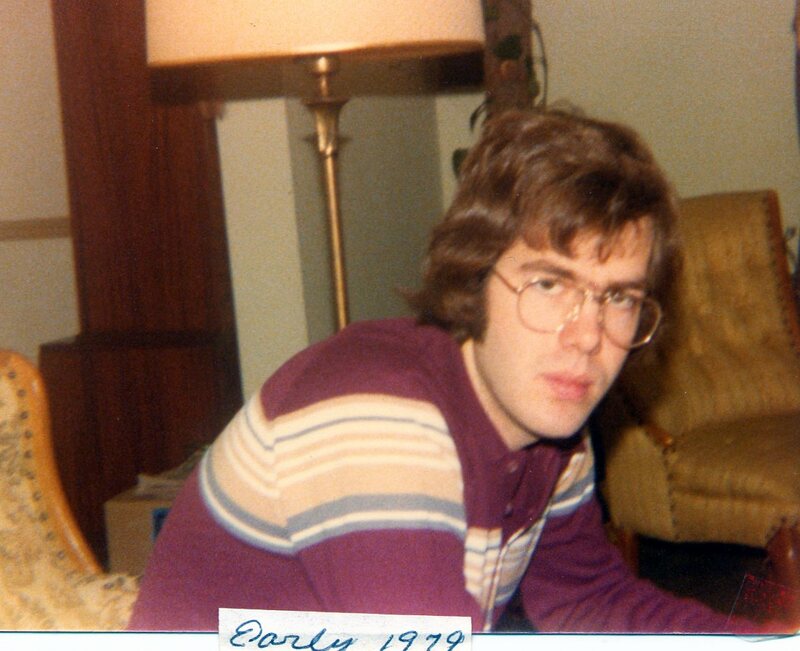 I have been coming on mission trips since 1982. This is something I have never seen. 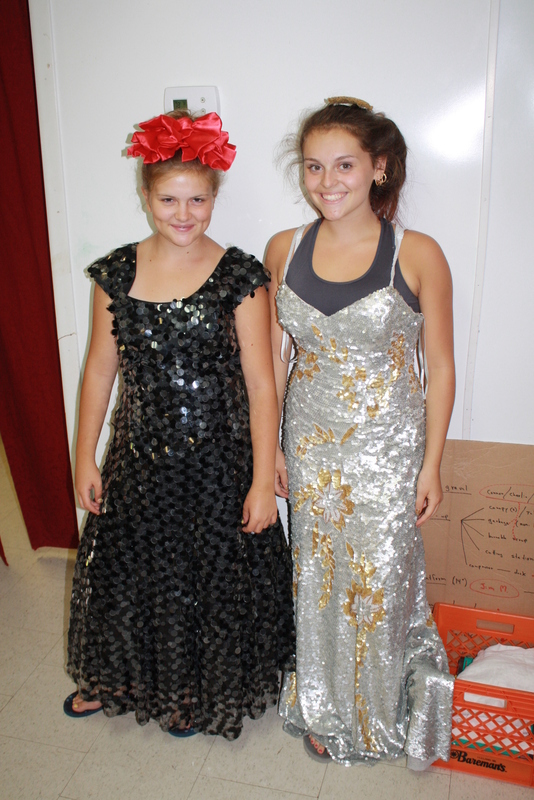 The glories of a thrift store on site! It wouldn’t be youth group without an inane game. Here’s one we made up tonight. 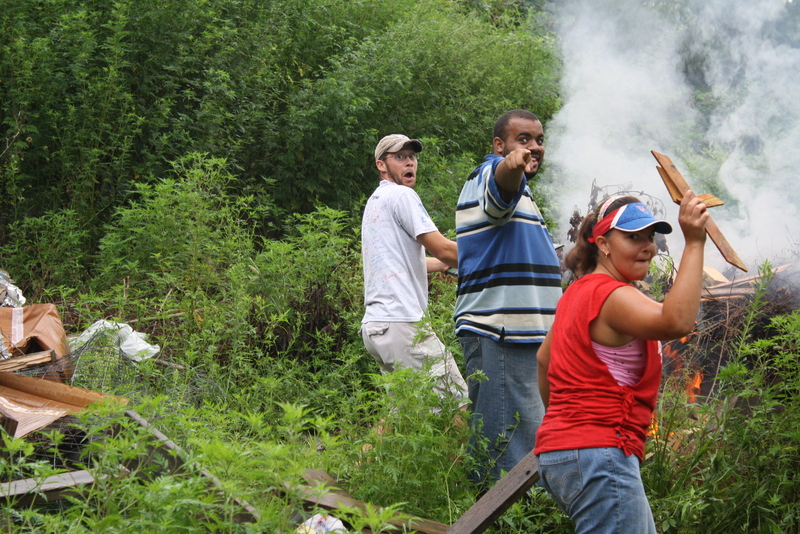 The 2012 edition of the CHUP Youth Mission Trip has started off with a bang. Literally! More about that in a moment. First, the team of 9 young people and 3 advisors was commissioned in worship on August 5, and left for Tennessee shortly thereafter. We drove through some rain, and then hit a patch of sunshine right as we encountered the amazing New River Gorge in West Virginia. 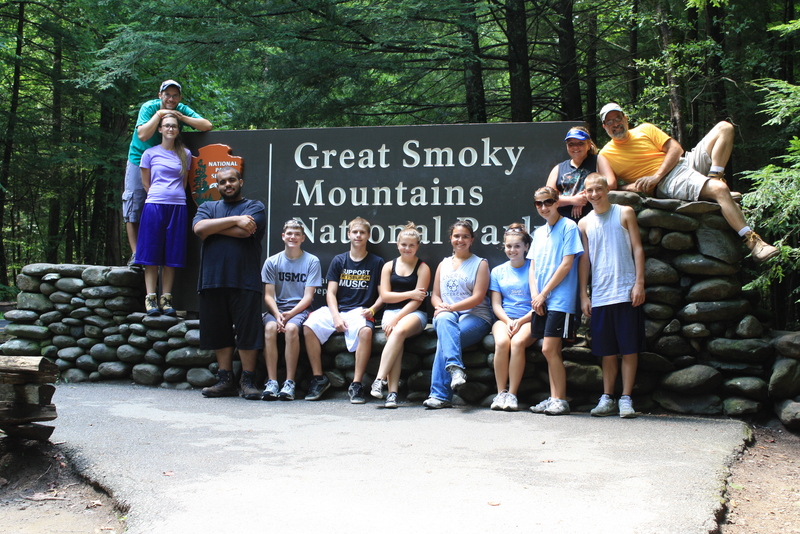 As in past years when our travels have taken us through this part of the country, the Youth Group stopped for a few moments to reinvigorate ourselves. It’s a great chance to see some astounding beauty, to use the restrooms, and to let the young people burn some energy by running up and down the steps to the observation deck. The bridge spanning the gorge is the longest single span arch bridge in the Western Hemisphere, and at 876 feet high, it was the world’s highest vehicular bridge until 2004 (it now ranks 5th). It is spectacular. After leaving the bridge behind, we settled into the cars for more riding, and more rain. At times the weather was simply incessant – the road was difficult to see and the driving team did wonderfully to stay together and to stay safe. With a few exceptions, the stuff in the trailer stayed dry as well. One snafu we encountered was the fact that our Mapquest directions were wrong as we entered into the hollers of Appalachian Tennessee. That meant driving down a dead end road and then having to back the trailer up it in the rain and in the dark. Needless to say, those kinds of shenanigans delayed our arrival. We had hoped to arrive at the center at 8 pm, but as it turned out it was nearly 11 before we got here. As we neared the destination, we found it interesting that there were a lot of firetrucks on the road to give us directions, and they all knew exactly where we were going. This is the scene that greeted us as we arrived at Sunset Gap on Sunday Evening. 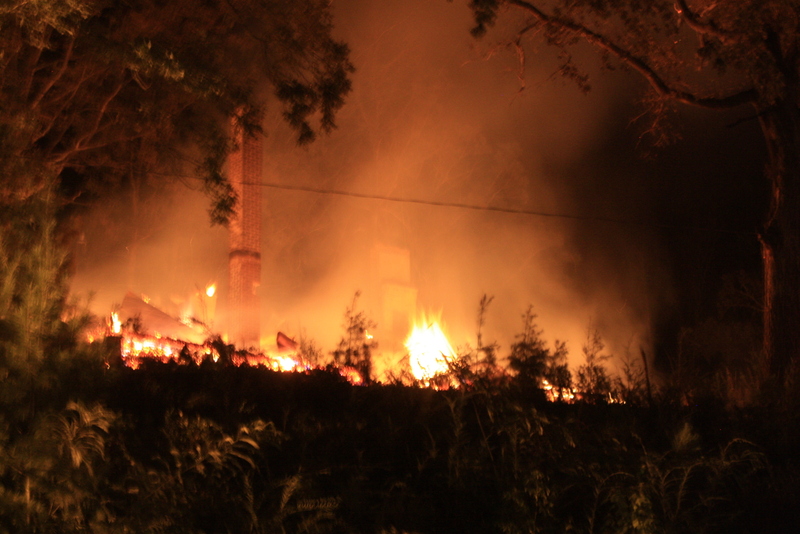 The dorm where we were to have stayed had burnt to the ground an hour earlier. 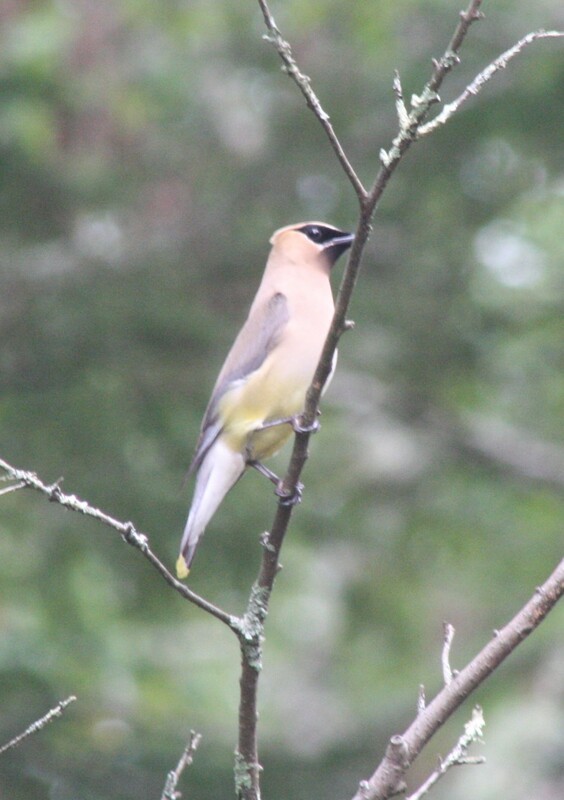 We praised God that we were so late – and thus not hurt, not endangered, and not in the way! We discovered that we are the last group to be here for the summer, and there is an “emergency back-up dorm”, so we eventually nestled ourselves into that and headed for bed a bit after midnight. When we woke up, we had a good breakfast of sausage gravy and biscuits and then went up to the scene of the blaze for morning devotionals. We prayed for the staff and ministry of Sunset Gap and asked God to give them the direction and help that they need to move forward. 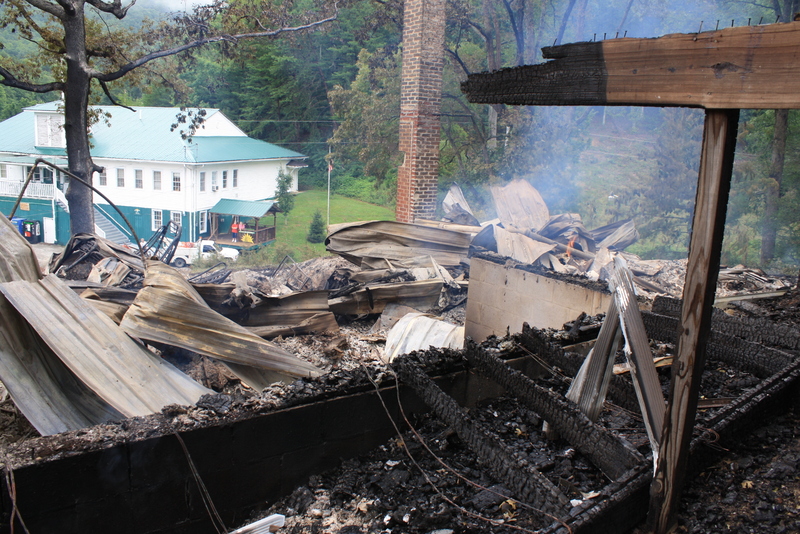 The remains of the dorm at Sunset Gap are still smoldering the morning after. More on the fire is here. After conversation with Josh, the supervisor here, we discerned that the best thing we could do would be to disappear for a while. So we loaded up the vans and began to explore. Our first stop was the Great Smokey Mountains National Park, where we visited Clingmans Dome, which is the highest point in the Great Smokey Mountains. 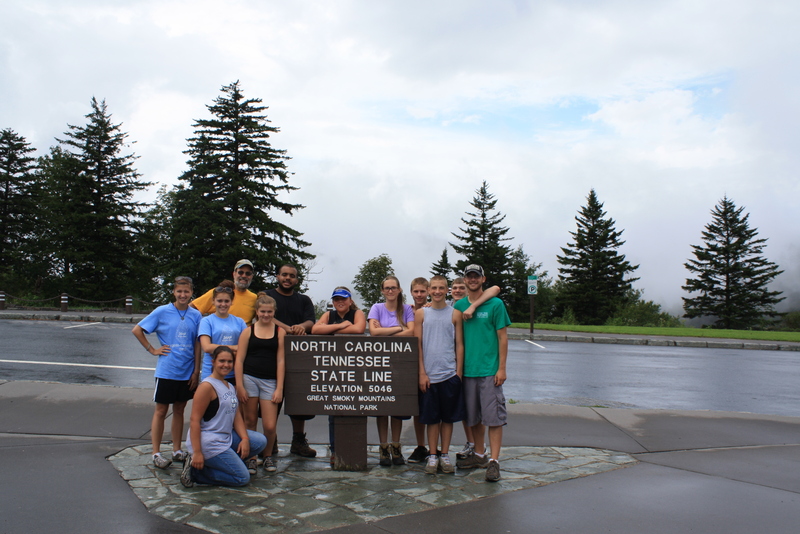 We hiked a bit on the Appalachian Trail (through the blazing sunshine and the pouring rain!). We also stopped at Newfound Gap, where the kids had a chance to put one foot in North Carolina while keeping the other in Tennessee. The park visit ended with an hour and a half or so at the Visitor’s Center, where we toured the museum and watched a brief video on the history and ecology of the park. Are we in Tennessee? Or North Carolina? Or Both??? Just outside the park is the tourist mecca of Gatlinburg, TN, where we enjoyed a delicious burger and walked up and down the kitschiest Main Street I hope to see for a while. 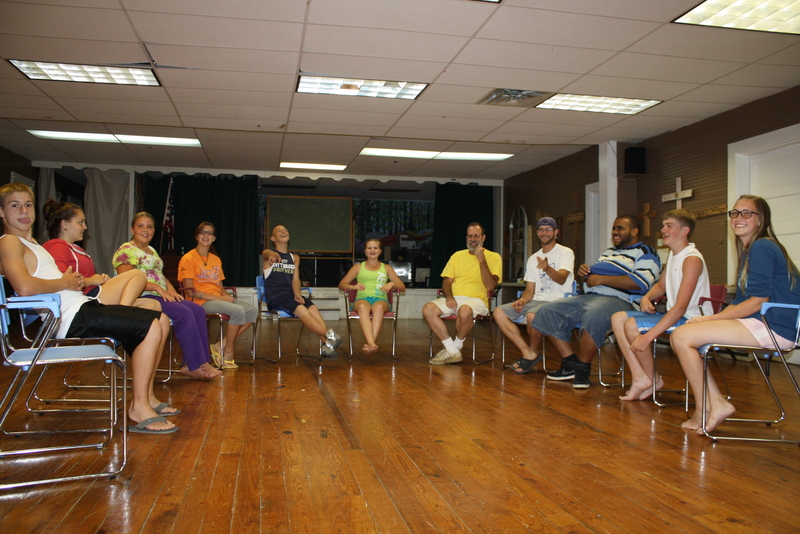 Upon returning to Sunset Gap, we had our evening devotions and then played a few games before heading to bed. 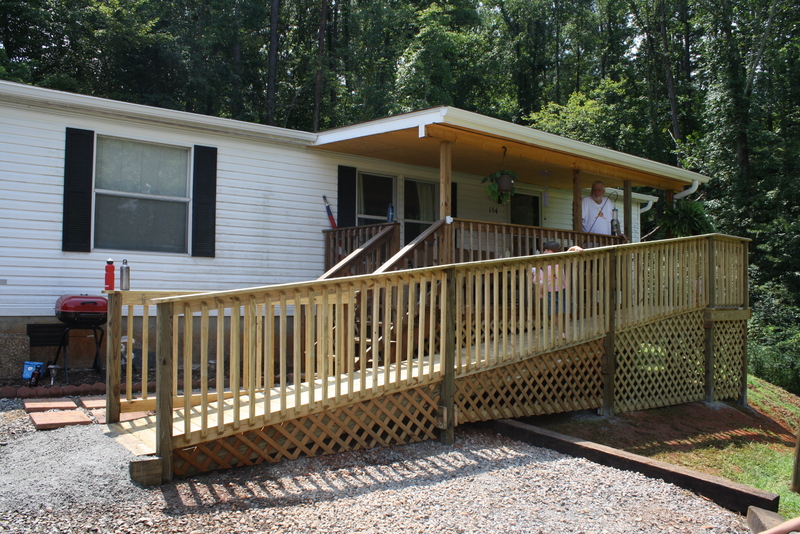 On Tuesday we anticipate beginning a work project – adding a wheelchair ramp to a home in a nearby community. In addition, we expect to welcome Melanie Newsom, a former Youth Advisor who has now relocated to Knoxville, TN, for a couple of days. As always, we appreciate your prayers!